Japanese writing is a little bit intimidating. Even if we don’t consider kanji, there are two other writing systems to worry about, each with around fifty letters each. While these systems are phonetic (letters correspond directly to sounds), that’s still a hundred letters! (Well, 92.) How do you memorize them all? When I first started learning Japanese, this was the bane of my existence. 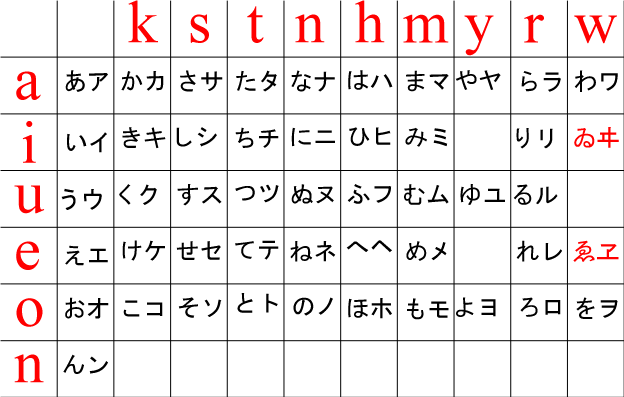 I knew I couldn’t do anything if I didn’t learn the alphabet, but unlike the Greek alphabet (which I’d learned before), Japanese “kana” come in blocks of two sounds, a consonant and a vowel. Further, though this is nice for reading comprehension after you already know the kana, the set of kana that begin or end with the same sound don’t similar at all (sa looks like this さ, se looks like this せ, and so looks like this そ). I had a huge problem learning nearly a hundred completely unrelated characters that had no direct connection to the individual phonemes. One of the things that I tried when I was first getting started with learning the alphabets was cutting a hundred index cards in half and put a letter on each. Yet, a hundred Japanese-letter-to-romaji-translation cards later, I hadn’t really learned anything, and reviewing those cards just frustrated me. It turns out, though, that the answer was incredibly simple, if perhaps slightly daunting. Here it is. Read. Even if you can’t understand anything. Read the Japanese version of the “this plastic bag is a choking hazard” warning on some packaging. Don’t worry about the kanji, just read the kana. Randomly use Japanese Wikipedia (fyi, the Japanese word for Japanese is 日本語, in case you’re wondering which language option to choose). When you look up kanji, look them up using a dictionary like Rikai, which gives you the pronunciation using kana. The optimal way to memorize anything is to use it. All of that being said, here’s the most surefire way to make sure you don’t memorize kana: don’t use them. Learn Japanese using romaji. (Not only will this mess up your ability to learn kana, it will mess up your pronunciation.) Focus on grammar and vocabulary before learning the alphabet. Never be able to read real Japanese. There are many methods of learning Japanese, but I can inform you that this is the worst one. Learning three alphabets can be pretty intimidating, but with a bit of time and dedication, and a lot of making sure you don’t beat yourself up when you don’t know stuff, you can get there.